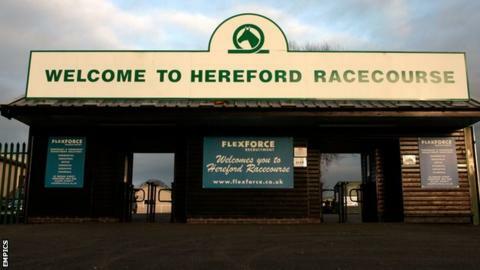 Recently-retired Herefordshire trainer Richard Lee says he would "back anybody" who would try and bring racing back to the county's racecourse. The Roman Road course was closed at the end of 2012 on financial grounds after 241 years of racing - a decision Lee, 68, described as "a tragedy". "I would love to see it open up again, it would be a cherished ambition," Lee told BBC Hereford and Worcester. "I'd back anyone - help anyone - who wanted to save it." The course itself is owned by Herefordshire Council but Arena Racing Company (ARC) are lease holders and shut the venue in December 2012 saying it was no longer financially viable to keep it operating. The course currently hosts Arabian races and point-to-point meetings but two-time Welsh Grand National winning trainer Lee was adamant it was a situation that suited nobody. "ARC are still paying the council rent for it and having to maintain it in good condition and they're getting nothing for it - I just don't see why they've done it - it's a tragedy," Lee said. "Hereford was a very fair racecourse, the fences weren't there to trap or trick horses. "Racecourses can be run at a profit. Take Ludlow as an example, it's a private course and a lot of the money is ploughed back into prize money so all the good horses go there." And with the majority of ARC's current 17-year lease still left to run, Lee is nervous about the racecourse's future. "What's going to happen when the lease expires? Once it's gone it's gone," he said. "The council say they're not going to build on the site but the same people are not going to be there in 15 years."